BART carries approximately 430,000 passengers on a typical weekday. During peak periods, BART transports more people from the East Bay to San Francisco than the Bay Bridge. BART’s daily riders save nearly 140,000 gallons of gas and directly reduce CO2e emissions by 2.7 million pounds per weekday. Visit our Green Facts page to learn more. BART makes possible dense, mixed land-use patterns, contributing to places where people can rely less on cars for their daily needs. The compact, walkable communities made possible by BART support healthy lifestyles, and also reduce transportation costs for its riders. BART is committed to advancing regional sustainability by providing safe, affordable, equitable, and environmentally-friendly transit to move people to jobs, recreation and services. BART incorporates cost-effective sustainability through fulfillment of the goals found in the Sustainability Policy. Visit our Policies and Plans page to learn more about our sustainability goals. For more information, see the pilot program frequently asked questions (PDF). 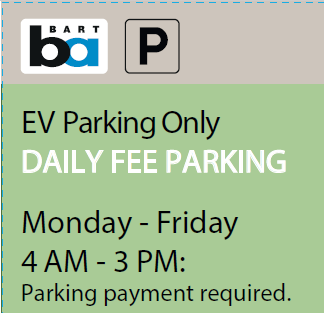 If you have additional questions or comments on the EV pilot program, please email BARTEVPilot@bart.gov. *NOTE: Existing Monthly Reserved permit holders can park in the 3 designated EV charging spaces on a first-come, first-serve basis. 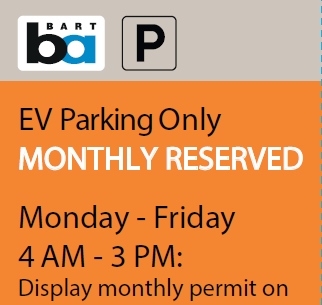 There are no separate monthly permits for only parking in the EV charging lot. Monthly permits must be displayed on your front dashboard. Any monthly permit holders found parking in EV charging spaces that are otherwise designated (per the signage in front of each EV charging space) are subject to fines. December 2017 – On December 7, 2017 BART took bold action to improve the climate footprint of the Bay Area’s transportation sector. Following BART’s adoption of an aggressive and industry-leading Wholesale Electricity Portfolio Policy (PDF) in April 2017, the BART Board of Directors today approved two 20-year renewable energy power purchase agreements. One of the agreements calls for NextEra Energy Resources to build a new 61.7 MW (megawatt) wind energy project and the other calls for Recurrent Energy to build a new 45 MW solar energy project. Both projects will be located in Kern County and are expected to be online by January 1, 2021. BART currently gets 4% of its electricity supply from renewable sources, but that will increase dramatically with these two new agreements. Renewable energy will account for about 90% of the District’s electricity portfolio starting in 2021, when the two new renewable projects begin delivery under the agreements. As BART’s energy needs increase, the new renewable energy agreements will provide about 75% of BART’s electricity needs beginning in 2025 and continuing through 2040. The two agreements build on BART's Wholesale Electricity Portfolio Policy, which calls on BART to get at least 50% of its electricity from renewable sources by 2025. The new agreements mean BART is well ahead of that goal. Ultimately, BART plans to get 100% of its electricity from renewable sources by 2045. April 2017 – As BART continues to grow so will our use of renewable energy. The recently opened Warm Springs Station has a 512kW on-site solar system that powers the station and the electric vehicle (EV) chargers. The system produces enough energy to power approximately 100 homes. Click here to read more about sustainability at the Warm Springs Station. 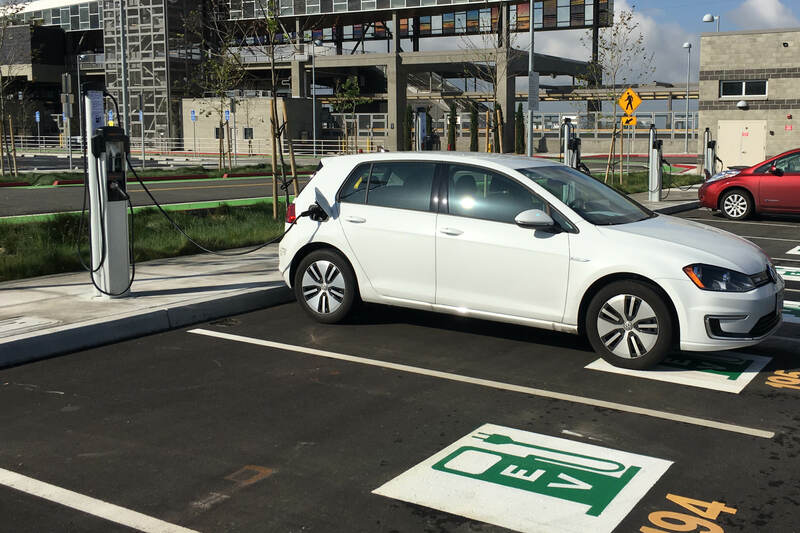 Warm Springs is the first BART station with EV charging stations. There are 42 Level 2 charging stations available for BART riders. The EV charging stations are part of a pilot and will be studied and monitored to assess their use and effectiveness. 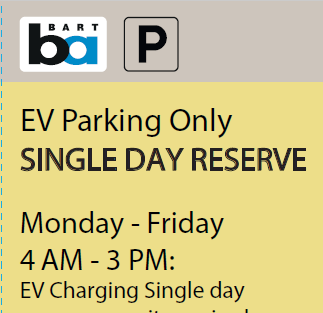 The study will determine how EV charging may be integrated into BART's parking portfolio in the future. Click here to read more about how to use the EV charging station.